The Kings XI Punjab are coming off a very good victory against the Mumbai Indians at Mohali where they have really enjoy playing. KL Rahul, Gayle and Agarwal look in good touch which is a positive sign for them. The Delhi Capitals on the other hand are coming of a nail biting Super over victory against the Kolkata Knight Riders and will be looking to continue on that positive energy. Out of the 22 matches played between the two teams, the Kings XI Punjab have managed to lead the contest with 13 wins to their name. At Mohali, the Kings XI Punjab have dominated winning 5 out of the 6 games played. KL Rahul, for the Kings XI Punjab, played a very sensible innings of 71 not out from 57 in the previous match against the Mumbai Indians. This innings would have given Rahul a lot of confidence after failing in the first 2 games, and will now look to continue this form. Shikhar Dhawan, for the Delhi Capitals, is one of the senior batsman in the side and he will be looking to lead from the front. He has got off to good starts so far, but hasn’t gone on to get a big one. Looking at youngsters around him perform well, he will look to build on his starts and play a match winning innings. After winning comprehensively against the Mumbai Indians, the Kings XI Punjab will look to maintain the same team. They will look to swap back Mujeeb Ur Rahman if fit. The Delhi Capitals looks like they have settled on a good combination and will look to go unchanged as well. The Mohali pitch is expected to be a flat pitch with slight assistance for pace bowlers early on. It is expected to be a neck to neck contest as Punjab have traditionally done very well at Mohali. But the Delhi Capitals should start as favorites since they have a better balance in the team and have more contributors. Most of their batsman have looked in good touch and their bowling attack is one of the best in the tournament. On the other hand, the Kings XI Punjab depend a lot on their openers to fire which is not going to help them perform consistently. 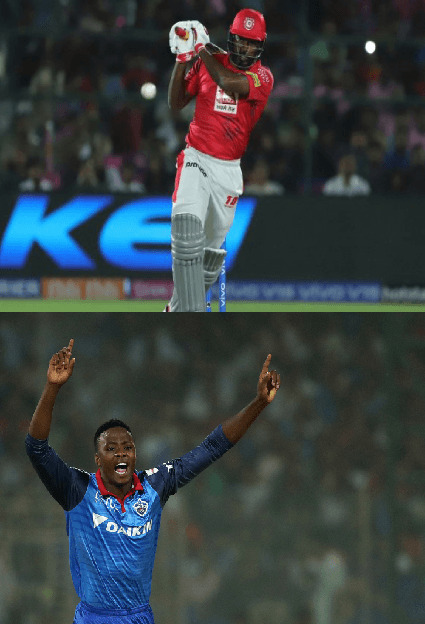 The Gayle vs Rabada will be a very interesting contest to watch out for. Gayle is someone who likes to take the bowlers on but has had history of struggling against genuine pace. Rabada is an equally aggressive bowler with genuine pace and will be looking to attack Gayle from ball one.